D-Link has stepped up the powerline networking game by releasing the first kit that can support data speeds up to 2,000Mbps over a home's electrical wiring and will be ideal for 4K streaming. The PowerLine AV2 2000 Gigabit Network Extender Kit (DHP-701A) is the first such kit to arrive with AV2 2000 MIMO technology that can support the higher network speeds and give coverage that some wireless routers will struggle to match. 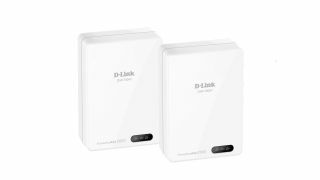 D-Link's kit comes with two identical adapters that facilitate the connection both of which have to be plugged into the wall. One is then connected up to the router using an ethernet cable and the other placed in another location where a wired connection will be established. You can link up to 16 adapters together using the system and the DHP-701A also offers easy plug-and-play installation, power-saving mode that cuts back on consumption by up to 85%, and backwards compatibility with HomePlug AV and AV+ adapters. The DGP-701A is available right now in the US for $129.99 and pricing for the UK and Australia will be confirmed in due course.